Soak the rice for minimum 6 hours in water. Also soak urid dal and fenugreek seeds in the same container for 4 hours. can even soak it for 6 hours cos some people may forget to do that (ME!!). First grind the urid dal and fenugreek seeds in a wet grinder (or some kind of blender), adding water until it becomes thicker. It may take 25 to 30 mts. Urid dal needs more water than rice. When it is ready, pour it in a vessel. 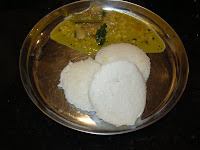 Now grind the idly rice in the same manner. This may take 30 to 35 mts. Now pour this batter into the urid dal batter. Add salt and mix it thoroughly with your hand(this is very important). Do not use spoon or spatula for mixing. Keep it aside, to ferment. Do not keep the batter in refrigerator before fermentation. I usually make this batter in the night around 8 pm and keep it aside. It will ready for next day evening tiffin. To make idly, mix the batter well. Take the idly mould, spread some oil in it (preferably sesame oil) and pour the batter in the moulds and steam cook it for 15 to 18 mts. In order to see whether it is ready or not, use the back side of a spoon or knife or toothpick or match stick and insert it into the idly. It should come out clean when you take it, without any batter. 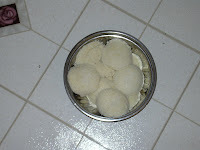 This means the idly is ready to serve. Serve it with chutney or sambar(see receipe) or Idly molagapodi.